In 2001, Young publicly backed the USA Patriot Act, aligning himself with the Bush administration. 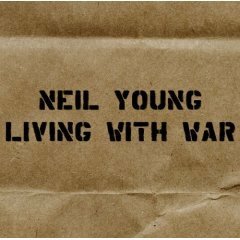 “Living with War’ comes just seven months after the release of Young’s highly praised album “Prairie Wind,” which has sold 450,000 copies in the U.S. to date. Earlier in his career, Young worked with Crosby, Stills and Nash, whose performance at Woodstock in 1969 rocked the 300,000 concertgoers at the three-day music festival. In 1970, Young wrote “Ohio,” protesting the killing of four Kent State students by the Ohio National Guard during an anti-Vietnam War demonstration. The album is expected to be released online before the end of April and to be available on CD sometime after that.